The Trump Economy in One Chart. Sham hearings for Brett Kavanaugh in the Senate Judiciary Committee will begin 9/4, despite the fact that The National Archives can’t produce even the small part of his record that Republicans requested before late October. You have 25 days to make your voice heard. Call or tweet at your Senators today using SaveScotusToolkit.org. 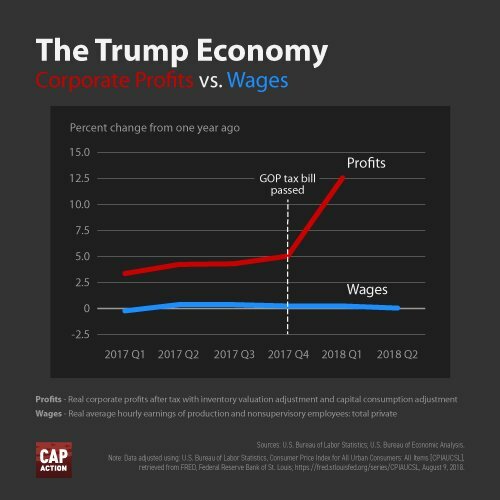 Trump’s economic agenda has been relentlessly aimed at helping big corporations, the wealthy, and Trump himself at the expense of the rest of us—and it’s succeeding wildly. At the same time, big corporations are stuffing their pockets thanks to Trump & Co.’s December tax scam, and making sure not one drop trickles down. RBG, NOTORIOUS FOR 25 YEARS. 25 years ago today, Ruth Bader Ginsburg took the oath to become a Supreme Court Justice. The second female Supreme Court Justice and a staunch defender of progressive rights and freedoms, Justice Ginsburg has become an icon to so many Americans.